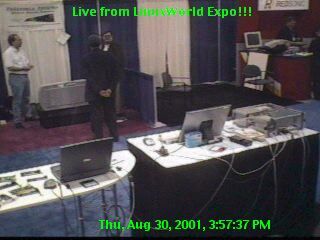 The Etherboot Project secured a .ORG Pavillion booth at LinuxWorld Expo San Francisco 2001. 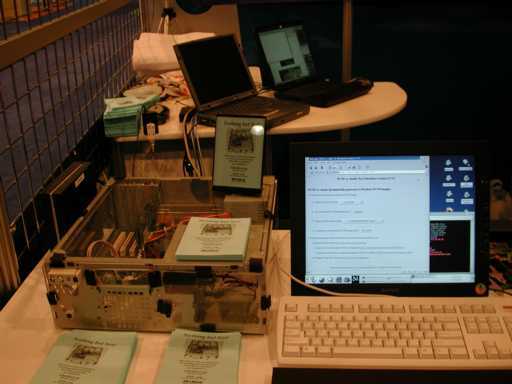 This is the demo machine that I constructed for demonstrating network booting. It is a Micro-ATX form factor. 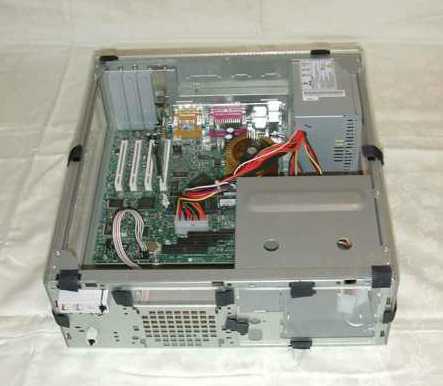 The motherboard is an Intel CA810EA, with on-board i810 video. I used a Celeron 566MHZ processor, and put in 128MB of RAM. It has 4 PCI slots, which I mainly used only one for demonstrating PCI NIC cards. With its aggressive heat sink, the CPU fan was not necessary, but I quickly reconnected the fan because people kept asking if the machine was really on! It ran flawlessly as a thin client. I removed all drives and cut plexiglas panels and affixed them with velcro for top, sides, and front in order to make a good display and so people would see there was (as our slogan says) "Nothing but Net!". 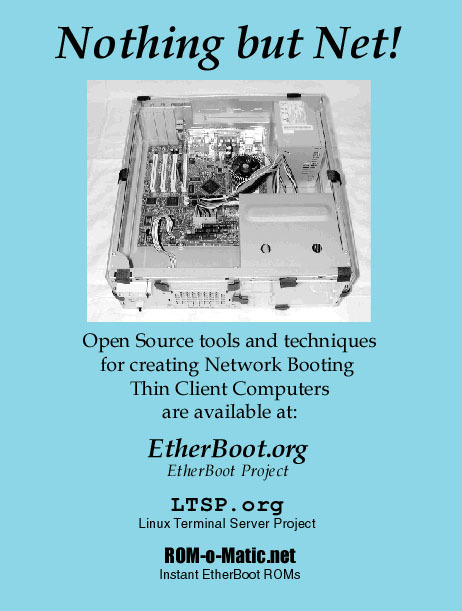 It was a pleasure and a privilege to represent the Etherboot Project at this LinuxWorld Expo. I will have many pleasant memories of the show, and one the most pleasant was when Chris DiBona of VA Linux came by the last day of the show and asked whether we would be interested in having a booth at the next show in New York. I gave a very strong "yes" to the idea, and am already planning for it. Though I can think of very few things that could have gone much better than they did, I can think of a few, and I'm sure by January we'll have some really good new things to show and new people to show them to.